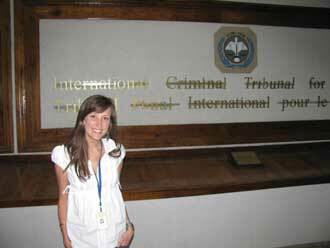 Jeannine Plamondon at the Office of the Prosecutor at the International Criminal Tribunal for Rwanda in Tanzania. This past summer eight McGill students were awarded a total of $64,000 by the Association of Universities and Colleges to pursue internships in the area of health, the environment and governance. Funded by the Canadian International Development Agency, these students rolled up their sleeves to do the hard work in such faraway places as South Africa, the Philippines, Tanzania and China. We asked some of our intrepid travelers to give their impressions of what it’s like working abroad. <!–[if !supportEmptyParas]–><!–[endif]–> Internship: Plamondon was a legal intern in the Office of the Prosecutor at the International Criminal Tribunal for Rwanda (ICTR) in Arusha, Tanzania. Internship: Dubois provided legal aid and support to refugees at the Refugee Law Project in Kampala, Uganda. <!–[if !supportEmptyParas]–>Internship: Miller interned at the Inter-American Institute for Cooperation in Agriculture (IICA) in Barbados where she conducted a feasibility study on the economic benefits of home gardening to alleviate food insecurity; created educational materials on sustainable gardening and the health benefits of domestic food production; and gave talks to local stakeholders and NGOs.